This is a very popular traditional folk toy consisting of wooden blocks that are held together with ribbon. When the toy is held at one end the illusion of a block tumbling down the ladder is created. Fascinating fun. This brilliant carpentry set continues to be extremely popular. It consists of real tools, scaled down to fit tiny hands. Ideal for children aged from about 8 years upwards it comes in a tough wooden storage box with a carrying handle. Ideal for all those budding Handy Andies and Andreas. Dolls are always popular with both boys and girls. 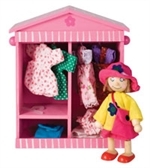 Daisy is a popular, flexible wooden doll who is lucky enough to have her own little wardrobe packed with assorted outfits. Children learn a lot through imaginative play with toys like this. A great toddlers toy, ideal for children from about 12 months. The ball may be rolled or shaken making the comical friendly faces pop out. 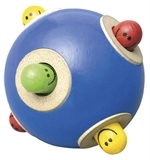 Immensely amusing and fun for a toddler this toy also helps them to develop their understanding of the physical world. Ideal for that personalised bedroom door name. Just let us know the letters needed to enable your child to decorate their bedroom door with their name in these heart covered letters. Like the Funky Letters but these are decorated with animals. They come with self adhesive backing that enables them to be easily attached to a bedroom door. A great way to personalise a bedroom or label a wardrobe. Sometimes called a swanee whistle, a piston flute or even a jazz flute. One of the easiest musical instruments to play great fun for children aged from about 3 years. Interestingly, this instrument became popular in the 1920s when it was used in some popular jazz tunes. The city of London in brightly coloured, chunky wooden models. This popular playset features famous historic buildings including Big Ben, Tower Bridge and St Pauls. There are also buses, taxis, policemen and guardsmen in this 33 piece set. And all for only £12.99. A great gift for children aged from about 3 years. Another excellent wooden toy for children aged from about 3 years. This cake stand laden with yummy looking wooden cakes is ideal for pretend tea parties. A great educational toy. OK, so it’s neither wooden nor traditional, but this is great fun and a great toy for children aged from around 5 years, but I’ll bet parents will not be able to resist having a go. This monkey has elastic arms that are used to catapult him through the air with his cape flapping behind him. As he flies he makes a screeching sound and can travel up to 15 metres. Amazing value at only £4.99. (There is also a Flying Pig in our online shop). All of our toys and games are top quality, robust and hard wearing. We hope that this list will provide some inspiration if you are looking for an alternative to the electronic plastic gizmos that are so common these days.